Yarn #2 has been added to the Baby Surprise Jacket. I hurriedly spun this the other night to go between the brown and the green. This project eats the yarn up at a frightening speed. It really lends itself to little bits and pieces of yarn, though. It’s past the decreases and on to the increases, and this is where it starts to look funny, indeed. Siri mentioned another jacket in the comments on the last post. It is another EZ pattern, and looks like nothing more than a BSJ without that extra bit of shaping at the bottom front. 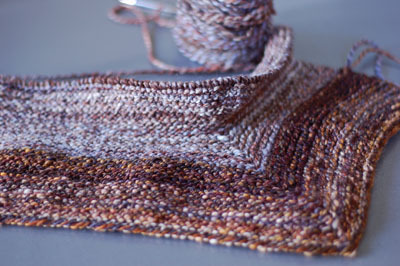 I think I might prefer the simplicity of this one (that shaping bugs me), but perhaps not in the heavy yarn I’m using. The fabric is quite thick and a double thickness at the overlap might be too stiff. Maybe next time with a finer yarn. There will be a next time, of course. This pattern sucked me right in. 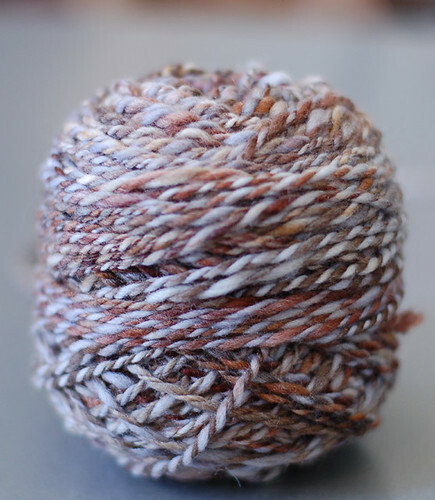 It looks so great – I love how the handspun is with this pattern. I love how your BSJ is coming along. I made one using very bright reds and oranges (Lorna’s Laces in Flame), and I liked it, but I also love the rustic tweedy-ness of yours. 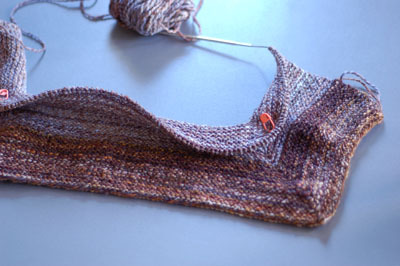 How large is it knitting up, in dk weight? I used sport for an infant, but wonder about sizing up for an older baby or toddler. it looks great. the colors are gorgeous. the pattern tells you it will be odd and it all comes together at the end when you fold it over. for a very chic baby. But what are you going to put *in* the BSJ? And where did the wicked smilies go? I did a baby surprise jacket in turqoise green and purple awhile back. The thing I didn’t like were my button holes. They seem to be too far in as written — how are you planning to deal with buttons? I thought on my next jacket (and I will do one again because they are magic)I might do an i-cord button band or perhaps clasps. Love the way the sweater is coming along. I may have to spin up some to make one. I also didn’t like the buttonholes on the two I made and love Ann’s idea of clasps. Thanks for getting my order to me so quickly, it was a nice surprise when I got home today. Yes, the handspun yarn with all those great colors does wonders for garter stitch, it’s looking great. Perfect for a sophisticated nature baby. That sweater is gorgeous. Definitely going to have to make one. It looks gorgeous! I was on the Schoolhouse Press website and saw in the back issues of Wool Gathering for sale that there is a pattern for Baby Jacket the Prequel, issue #61. The description says it predates the BSJ and sleeves are increased out from the underarm. I love that yarn you are using! I *need* to learn how to spin! Your work is so inspiring.